September was quite efficient regarding the new functionalities. Some people do not like simple a white statistic table. We added two more styles of statistic table white-gray zebra and colored table where rows for profit have a green background, and un-profitable have red. 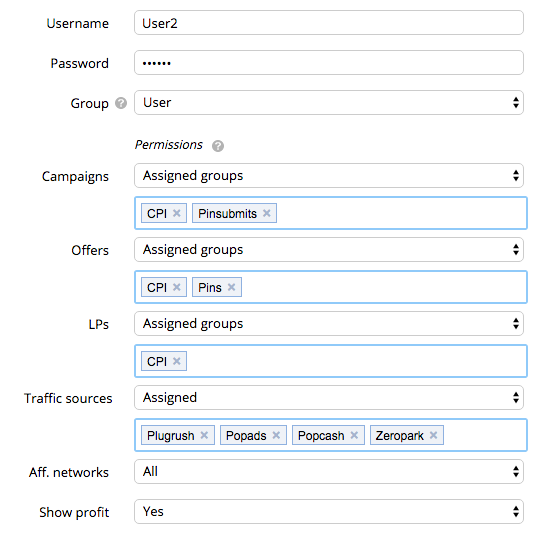 Because of the popular request by clients working in teams and purchasing department in affiliated networks, we added the possibility to use additional users to the tracker with access rights for campaigns, offers, landing, sources, etc. You can disable editing of all data, turn off displaying of profit/conversions/EVP. Each user can check statistics of his campaign. Also, grouping by user is available in all sections. You can mark publishers sent to the black- and whitelists if you want to keep track of them in the tracker. Also, you can mark stopped advertisements, OS, and traffics types. Besides, there is the possibility to filter stats by these parameters, including filtering by API. Also, we introduced marking of stopped/deleted landings/offers/ paths /rules. Now in campaign’s stats you can check active and inactive elements.